When it comes to your finances, most of your planning likely falls around emergencies and long-term financial goals. You often think of what to do when you don’t have enough money. But, have you considered your plan in the event of a financial windfall? While the idea of having additional income might not seem like something important to plan for, failure to do so could mean that that money simply goes to waste. Whether you’ve received an inheritance, bonus, gift, or even a lucky lottery ticket, knowing what to do with a financial windfall, big or small, can help put you in a better financial position. That being said, before you opt to go on a shopping-spree, consider these 7 best uses for your financial windfall. First things first, anytime you come into a surplus of money, you should always put it towards your debt. For the most part, debt has a high interest rate. So, the longer you allow it to accrue interest, the more money you’re giving away. Whether you have student loans, credit cards, or medical bills, start with the debt of highest interest and pay off what you can. In most cases, utilizing your financial windfall entirely towards your debt is the most beneficial decision financially. By doing so, you allot all future funds and surpluses to other financial goals and keep yourself from having to pay even more on your debt. If you have high interest debt, you could also consider refinancing it with a personal loan from Payoff. As mentioned earlier, when it comes to financial planning it’s always beneficial to think of life’s unexpected expenses. Medical expenses, car accidents, unexpected home repairs, or the loss of a job, all have a heavy impact on your finances. Nonetheless, if you’re adequately prepared for one such circumstance, said events don’t have to be as detrimental as you might think. After debt, your next great avenue for a financial windfall lies in contributing to your emergency fund. That being said, you don’t necessarily have to put your entire windfall towards this. But, you should carefully consider how much you should ultimately accrue. A good rule of thumb is to keep at least six months’ worth of your salary as an emergency. Of course this may decrease depending on whether or not you’re a two-income household. Whatever you decide, figure out a number and use a good portion of your windfall to supplement this fund. Like most people, you probably dream of the hard-earned day that you can retire. When you do, you’ll want to ensure that you’re financially set for the rest of your life. After all, no one wants to come out of the luxury that is retirement. That being said, until that day comes, you’ll need to contribute a steady amount to your retirement fund to ensure your financial stability. Again, while you don’t necessarily have to allot your total windfall towards retirement, you’d be wise to utilize a significant amount towards those future golden years. Another great alternative for a financial windfall is to assign some of that money to your financial goals. Whether you’re saving to buy a house or car, or have set up a tuition fund for your kids, distributing your surplus to various long-term or short-term goals can help you reach them that much faster. Moreover, with a windfall, you stand to contribute more than you normally might since it’s extra money you’re not usually relying on. So, depending on the size of your windfall, decide which goals are the most significant. Then, portion out your money accordingly. 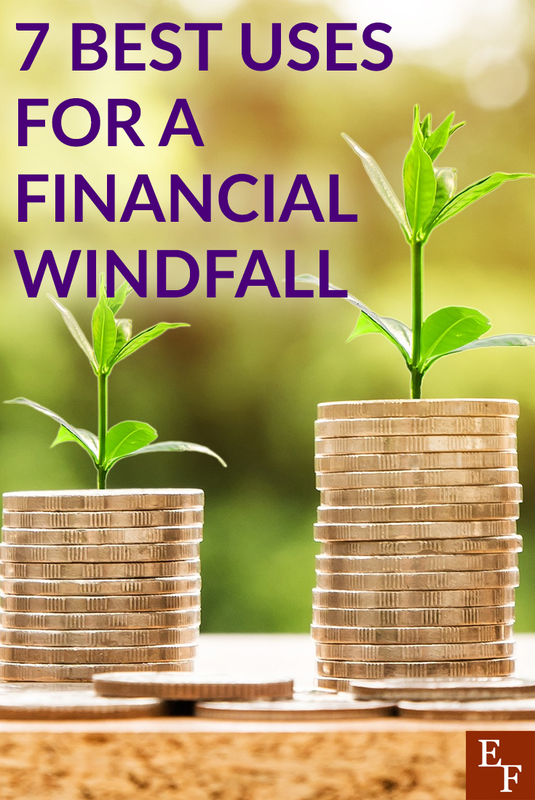 One important consideration for your financial windfall, before providing funding for the aforementioned, is to evaluate the areas of your life that might be in need. Are you behind on a payment, like your car or mortgage, or are there certain home repairs that can’t go unfixed for much longer? Whatever the need might be, use the opportunity of a windfall to eradicate it. While chipping away at debt is imperative and an emergency fund is important, if you have something of importance that can’t wait, be sure to take care of that first. If your debt is taken care of, your emergency fund well-stocked, and your 401(k) is steadily contributed to, giving your windfall to charity is always a viable option. Maybe you’re someone who would always like to give more, but find yourself handcuffed with other financial responsibilities. If that’s the case, use this as an opportunity to give back to a charity, organization, or cause that is important to you. You’ll be able to do some altruistic good with your money and receive a tax break when the time comes. While it’s financially beneficial and important to ensure that all your financial funds are sitting pretty, you can’t forget to treat yourself every now and then either. Plus, if your finances are in good shape, use 10 or 20 percent of your financial windfall for something fun. Update your wardrobe, plan a vacation, or redecorate your living room. Whatever you choose to do with your windfall, allotting a small portion towards something you truly desire, not only allows you to feel like you did something concrete with it, but makes it that much easier to keep from splurging the rest. That being said, make sure you take out that 10 or 20 percent of fun money and immediately put the rest where it belongs. That way you’ll ensure you stay within budget. A financial windfall can be a bright light in your financial life. It can help put your finances back in good graces or help steer you on the path to achieving your financial goals quicker than you expected. Ultimately, however, what you choose to do with your windfall is up to you. That being said, don’t waste the opportunity to put it towards something great. What have you done with a financial windfall in the past? What do you think is the most important thing to use it on?